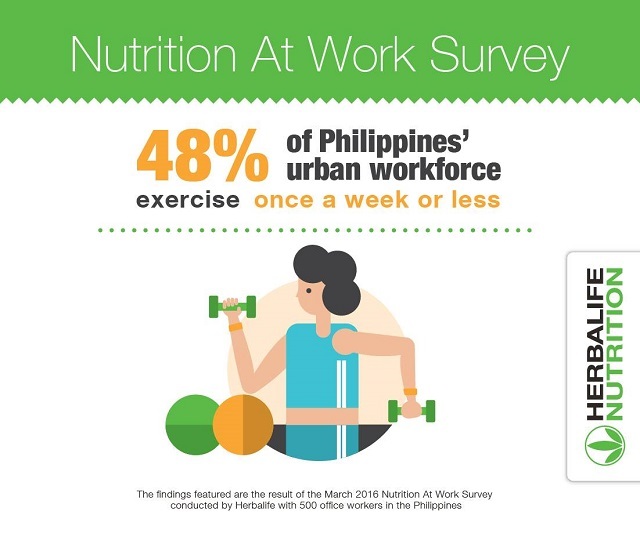 Herbalife, a global nutrition company, has released the findings of the new Nutrition At Work Survey, which revealed that the majority of Philippines’ workforce leads largely sedentary lifestyles, putting them at risk of obesity. The survey, which was designed to understand the lifestyle habits and attitudes of Asia Pacific’s modern workforce, was conducted in March with 5,500 full-time workers in 11 Asia-Pacific markets, including 500 workers from the Philippines. 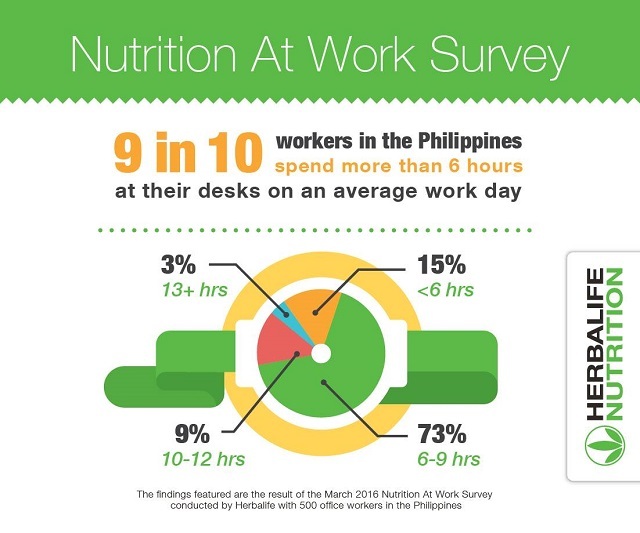 According to the survey findings, almost nine out of 10 (85%) workers in the Philippines spend at least six hours a day sitting at their desk, with 52% of its workforce eating lunch at their work desk two to five times per week. The survey also revealed that majority of Philippines’ workforce (86%) exercise less than three times per week, with five out of 10 getting less than 30 minutes of physical activity a day at their workplace. This suggests a significantly worrying trend locally, on the back of rising obesity rates recorded in recent years. Nevertheless, the risk of obesity could be averted if workers in the Philippines decide to take control over their own nutritional intake and exercise regimen. Close to eight out of 10 workers (75%) affirmed that they strive to live a healthy, active life, however, the majority of them noted that they find it difficult to stay active during workdays. Gary Small, M.D. has recently visited the country and shared his expert views on digital dementia and brain aging at the “A Smart Way to Healthy Aging: A Talk by Gary Small, M.D.” event. Dr. Small, a specialist in brain health and aging, has authored over 500 scientific works and received numerous awards and honors, including the "Senior Investigator Award" from the American Association for Geriatric Psychiatry. 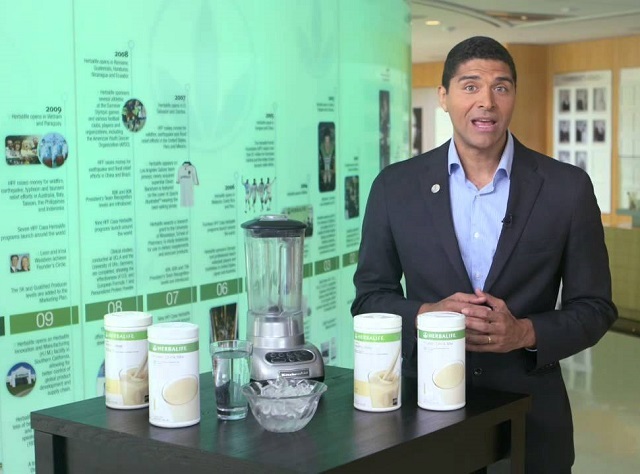 • Dr. David Heber, chairman of the Herbalife Nutrition Institute and Nutrition Advisory Board. A leading expert in the field of nutrition, named as one of “The World’s Most Influential Scientific Minds” by Thomson Reuters in 2014 and repeatedly included in “The Best Doctors in America”. • Dr. Chin-Kun Wang, an expert in metabolism and nutrition, with a focus on the clinical evaluation of nutritional supplements, nutraceuticals, functional foods and herbs. He was awarded the National Award of Biomedicine in Taiwan in 2008 for his contribution to medical education. • Dr. Julian Alvarez Garcia, a specialist in sports medicine and sports physiology who has advised professional teams, national teams and individual athletes on a range of disciplines including weightlifting, triathlons, mountain biking, football and basketball. • Dr. Darren Burgess, an expert in sports science and nutrition who has authored papers in multiple peer review journals. He is also the current Head of High Performance at Port Adelaide Football (AFL) Club, and the former Head of Fitness and Conditioning at Liverpool Football Club. • Dr. Nataniel Viuniski, an expert in pediatrics and nutrition who has authored “Childhood Obesity – A Practical Guide”. He is also currently an advisor to Brazil's Health and Education Ministry for Childhood Obesity. • Dr. Francis Gregory Samonte, one of the Philippines’ premier experts in pediatric neurology, and the first Filipino appointed to the NAB. He was a recipient of the Chairman’s Achievement Award from the University of Louisville, Kentucky’s Department of Pediatrics.